Gas was just as important to those early Mother Road travelers as it is to the road journeyer of today. But back then it was different – a lot different. Before 1910, there was little need for gas stations, as automobile ownership was only held by wealthy hobbyists, who were required to obtain fuel from the local kerosene refinery. Later, after Henry Ford perfected mass production in 1908, vehicle prices were more affordable for the masses. To adjust to the demand, gas was then sold by the bucketful at general stores, liveries, hardware stores, and repair shops. Arduously, the gas was poured in buckets and then funneled it into their gas tanks. However, that all changed when the first gas pump was invented. In no time at all, shed-like structures, housing a gas pump or two, began to appear along the roads. Before long, the term “Filling Station” was adopted for these many curbside businesses. By 1910, gas stations began building bigger structures that included offices. The earliest companies, such as Shell and Standard Oil, began to take advantage of the space on the side of the buildings, painting their logos and names across the side. By the 1920s, gas station buildings often included canopies, added to protect their customers from the heat or rain. After Route 66 began to barrel through the eight states, gas stations started offering repairs and other services and she structures were enlarged again as service bays were added to the buildings. These structures continued to evolve over the years to the place that they are today, sometimes no bigger than those first early structures. 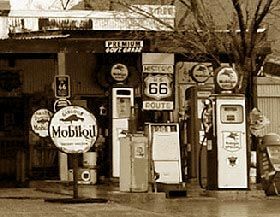 It was during the same year that Route 66 began to be built that the Whiting Brothers discovered that with just a little lumber from their father’s mill, they could easily construct a profitable gas station. Originally founded in Saint John, Arizona in 1926, Whiting Brothers Station soon became a familiar sight all along Route 66, as well as other areas in the Southwest. Extremely profitable, the brothers continued to expand their empire, adding souvenir shops, cafes, and Whiting Brothers Motor Inns to many of their stations. For years and years, the Whiting Brothers businesses were a staple along the Mother Road, along with Stuckey’s, Burma-Shave signs, and Indian Joe’s Trading Posts. 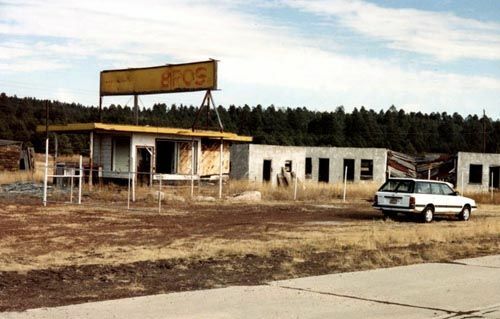 Alas, along with so many other profitable businesses along Route 66, the Whiting Brothers ended in the 1990s. 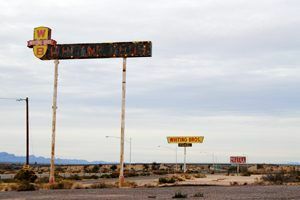 Today, with the exception of one remaining Whiting Brothers Station in Moriarty, New Mexico , and a few buildings that have been utilized for other businesses purposes, all that’s left of the Whiting empire are its fading yellow and orange signs and crumbling buildings. Soon, these too will most likely disappear, ending another chapter of Route 66 history. Listed below are the remains of Whiting Brothers Stations and Motels and what is known about them today. If you have information on other station or motels or know what has become of them please send us an email. Whiting Brothers in Bellemont in 1982, photo courtesy Cline Library. Bellemont – Just after World War II the Whiting Brothers established a gas station here with wood from powder boxes taken from the Navajo Army Depot to build the motel section of the establishment. Today, these ruins are slowly returning to the earth. At Bellemont, go off on the abandoned section of old Route 66, east of the freeway entrance to see the remains of the old Whiting Brothers cottage park. Flagstaff– There was once a Whiting Brothers Motor Hotel in Flagstaff located at 2134 E. Santa Fe. What has become of this building? Holbrook – We’ve got a vintage postcard of a Whiting Brothers Deluxe Motel in Holbrook.. Obviously in no longer exists, but has it now become something else? A reader on Facebook tells us it was across from the Wigwam Motel and is now a residence. Winslow – Once it was the first thing you would see when entering Winslow from the east. It was open for business in 1996, but four years later it was closed and boarded up. It has since been totally razed. 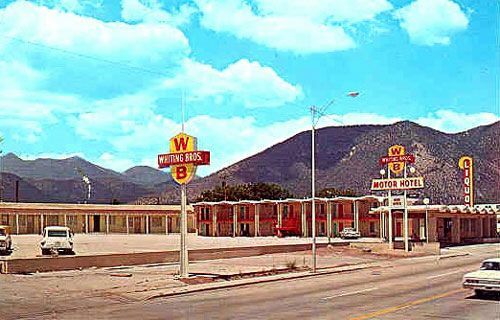 There was also a Whiting Brothers Motor Hotel located in Winslow but we have not been able to find what has become of it. Yucca – Once a large complex complete with a station and a motel, all that’s left today are the signs and a large empty parking lot. Whiting Brothers Motor Hotel in Flagstaff , Arizona, vintage postcard. At this old Whiting Brothers complex, there’s no more gas, no more groceries, and no more beds, Kathy Weiser-Alexander, January, 2015. Old whiting bros motel in continental divide nm with sign still up. It appears to be operAting with an open sign in door. It’s not listed on the highway services exit sign.